Adding to its hugely successful Inno Pocket range, ADJ has released its Inno Pocket Wash – a dual-effect moving head wash unit that utilizes four 10-watt quad-color (RGBW) LEDs and a wide 28-degree beam angle to create changing color washes perfect for flooding dance-floors, stages, clubs, bars, and entertainment centers, or for up-lighting venue walls, stages and décor. Users can now add the Inno Pocket Wash to the list of portable, affordable Pocket Series fixtures that includes scans, rolls, moving head beams and spots – all designed with compact power and professional-quality lighting in mind. The Inno Pocket Wash houses a powerful LED source, powered by four quad-color 10-watt LEDs, mounted on a moving head yoke that offers 540-degree pan and 180-degree tilt movement (8- and 16-bit) for unrivalled scope and versatility. With this flexibility of movement, using multiple units will fill venues with incredible color; bathing stages, dance-floors, seating areas and bars in vibrant light, at any angle. The Inno Pocket Wash’s freedom of movement also helps users realize new ways to manipulate its effects; for instance, it could be used to up-light the back of a stage but then lowered to a 90-degree angle, projecting mesmeric, super-bright color beam effects out into the crowd. Users can also use the Inno Pocket Wash to up-light venue walls, using the 12 built-in shows to create eye-catching color change effects. With this ability to provide room-enhancing up-lighting and create moving color washes, the Pocket Wash offers users two effects for the price of one. A room adorned with elegant colored up-lighting can soon be transformed into a lively party space, with the moving head features working their magic as soon as the party hits overdrive! Adding to this party atmosphere, the Inno Pocket Wash also boasts a Display Inversion mode for Master/Slave operation that creates unique, spellbinding, synchronized effects that grab the audience’s attention and inject events with pure lighting excitement. 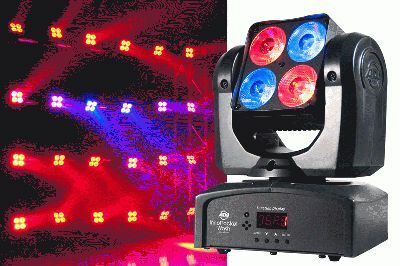 For added intensity, users can activate strobe and pulse effects – ideal for when the party is tired, crowds can soon be rejuvenated and club dance-floors re-energized. The Inno Pocket Wash gives users a choice of three operational modes – Internal Show, Sound Active and DMX-Controlled. While in Internal Show and Sound Active modes, the fixture generates atmospheric wash effects using a number of varied built-in shows; while users can gain more control over their wash lighting using the DMX mode, which offers a choice of four channel options – 9, 11, 19 and 21. This increased control allows the user to harness their creative potential, especially when it comes to utilizing the versatile movement of the Inno Pocket Wash and the color diversity offered by its quad-color LEDs. Users can also operate the fixture using an optional IR wireless remote, which allows control over strobing, color change, dimming and Sound Active on/off, without the hassle of wires, and with the convenience of operating the fixture from afar. Comparable to other Pocket Series fixtures, the Inno Pocket Wash is compact and, weighing a modest 15lb (7.2kg), extremely lightweight. Mobile DJs, entertainers and touring performers can take the Pocket Wash on the road; offering a small but equally effective equivalent to larger, bulkier fixtures. This portability also makes transporting multiple Pocket Wash fixtures simple, while ensuring that users have enough effects to flood venues with far-reaching, immersive light. Churches and entertainment centers constrained by strict budgets can also enjoy the fixture as an affordable wash solution that gets distinctive results while remaining easy to operate and setup. The Inno Pocket Wash gives users portable power and forward-thinking design without the need to spend big. However, with its 2-in-1 effects and the flexibility enabled by its powerful, yoke-mounted, quad-color LED source, the Pocket Wash not only allows sophisticated static up-lighting but also the ability to incorporate stunning moving washes into a more extensive, active lightshow. Sitting perfectly alongside the other Pocket Scan, Roll, Spot and Beam fixtures, the Inno Pocket Wash lets the user give their audience a mesmerizing, memorable lighting experience without breaking the bank.